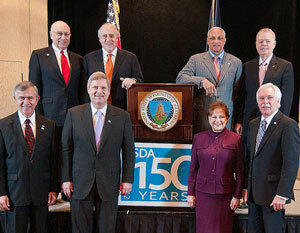 This is one Agricultural Outlook Forum I really wish I could have attended just to see most of the past and present Secretaries of Agriculture gathered on one stage together to celebrate the 150th anniversary of the U.S. Department of Agriculture. President Lincoln established USDA because he recognized the potential of America’s farmers and ranchers to provide a safe, ample food supply for our nation and the world. Throughout 2012, USDA will recognize important events, such as President Lincoln’s signing of an Act to establish the Department of Agriculture on May, 15, 1862 and the July signing of the Morrill Act to establish public land grant universities. See more photos of Secretaries Day at the USDA on the agency’s Flickr photo album.